I could hardly get through Merlot month without drinking one of the finest merlots I’ve ever had, the Duckhorn Three Palms Vineyard Merlot. I have been drinking this wine on special occasions for at least 30 years, and it never disappoints. The 2015 vintage is spectacular and well worth the splurge to taste this outstanding wine. This merlot is an intense, powerful wine with many layers of complex fruit and mineral flavors. Dark fruit flavors predominate, but as the wine opens up and you sip it other flavors sneak up on you. It is a gorgeous deep red in the glass, with aromas of blueberry, cranberry, fig and cedar. The wine has a rich mouthfeel, with flavors of cherry, plum and chocolate. All of it is infused with fresh minerality, reminiscent of slate. The blend is 91 percent merlot, 7 percent cabernet sauvignon, 1.5 percent petit verdot and .5 percent cabernet franc. The wine drinks beautifully now, but you could lay it down for several years and it will continue to improve. I have several Duckhorn merlots in my cellar that I have been drinking 7-10 years later, and they all have been outstanding. The 2015 vintage is a nice follow up to the 2014 Three Palms, which was Wine Spectator’s Wine of the Year in 2017. Duckhorn Vineyards has been producing a vineyard-designate merlot from Three Palms since its inaugural vintage in 1978. I drove up and down the Silverado Trail several times over the years, looking for the vineyard until a few years ago I finally spotted three very tall palms sticking up in the middle of a vineyard. I don’t know how I could have missed seeing them so many times. The vineyard is notable for its unique terroir, featuring lean soils that encourage the vines to send their roots deep to find water and nutrients. The vineyard is in a warm northern part of the valley, away from the cooling fog that comes up from San Francisco Bay. The wine was aged 18 months in oak. I drank this wine in October for Merlot Month, but got busy and forgot to write about it. I just found my notes and decided it’s never too late to tell wine drinkers about such a wonderful merlot. As mentioned, I have been drinking this wine for a long time and have never had a bottle that was less than spectacular. Back in the 1980s I learned about two California wineries that were known for their merlot: Duckhorn and Sterling. The winemakers at Sterling introduced vintage dated merlot to California. Dan Duckhorn founded his winery after visiting Bordeaux with the winemaker from Sterling. While Sterling wines were widely available, Duckhorn merlot was this mysterious whisper that everyone talked about, but no one could find. I was living in Charlotte in the 1980s, and I could not find a Duckhorn merlot until I visited Chapel Hill and found it in a boutique wine shop. I have been a fan of their merlot ever since. The Duckhorn is easier to find now. Winery: Duckhorn and merlot are linked forever in the minds of wine lovers. 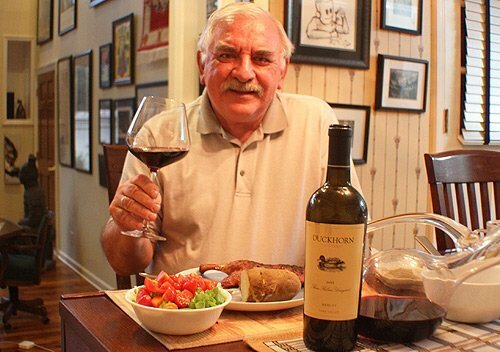 Dan Duckhorn and his wife Margaret made the decision to focus his passion on making a world class merlot when they opened their winery in 1976. He had just returned from a trip to Bordeaux where he saw what great wine could be produced from merlot, and he knew the Napa Valley could produce wines that matched the best in the world. Dan Duckhorn is a Santa Rosa native and graduate of the University of California at Berkeley. Working his way up to become president of Vineyard Consulting Corporation, he learned about wine making from the soil up. He saw that change was coming to wine country, with consumer tastes shifting away from common varietals to higher quality wines. After the trip to France Dan and a small group of friends founded Duckhorn Vineyards in 1976. It was one of the first 40 wineries established in Napa Valley. The 10-acre property in St. Helena later became home to the Duckhorn Vineyards Estate House, their gorgeous tasting room along the Silverado Trail. Huge windows look out to the vineyards, making a spectacular setting for tasting their wines. Their first harvest brought 800 cases of merlot from the Three Palms Vineyard and 800 cases of Napa Valley cabernet sauvignon. Both wines were big hits and the brand took off. The first Decoy red blend came in 1985, and was so well received that the Decoy lineup quickly expanded to cabernet sauvignon, merlot, zinfandel, pinot noir, rosé, chardonnay and sauvignon blanc. All come from Sonoma County. Duckhorn greatly expanded its holdings beginning in 1988 by purchasing seven estate vineyards on Howell Mountain and the valley floor for a total of 168 acres in Napa Valley and four vineyards totaling 153 acres in the Anderson Valley, Mendocino County. In 2005, the San Francisco Chronicle named Dan Duckhorn its winemaker of the year and named four of his wines to its list of top 100 wines of 2005. Four years ago the winery acquired a state-of-the-art winemaking facility in Hopland that allows the winemaking staff to control every part of the process. Besides Duckhorn, the company now owns Decoy, Goldeneye, Paraduxx, Migration, Canvasback, Calera and Kosta Browne. The Duckhorn label features several single-vineyard merlots as well as a Napa Valley merlot. They also produce chardonnay, sauvignon blanc, cabernet franc, cabernet sauvignon and a red blend. Goes with: We had this luscious wine with the perfect merlot food, roast duck. I have loved duck all my life, usually getting it only at restaurants. I’ve tried making it at home, but when you roast a whole duck on the grill, there is so much grease dripping out there are near-constant flames. Finally, I have found an easy-to-prepare roast duck. Local grocery stores have half ducks, already cooked, in the frozen food section. You just put the duck on the grill for about 15 minutes total and it’s ready to eat. It’s delicious and even comes with orange sauce if you like that. We added a baked potato and tossed salad and had a memorable meal. The hearty, complex wine was able to stand up to the strong flavors in the duck. The wine made the duck better and the duck made the wine better, which to me is the perfect meal. I also like the thought of having Duckhorn wine with duck. I’m easily amused.